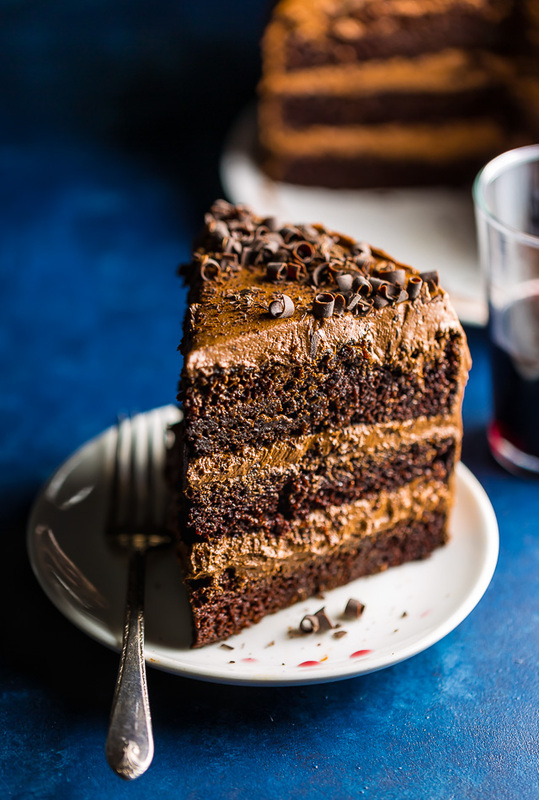 Supremely moist and flavorful, this Red Wine Chocolate Cake is perfect for special occasions! Valentine’s Day is right around the corner, my friends! And although my special someone will be away for the holiday, I still plan on celebrating. 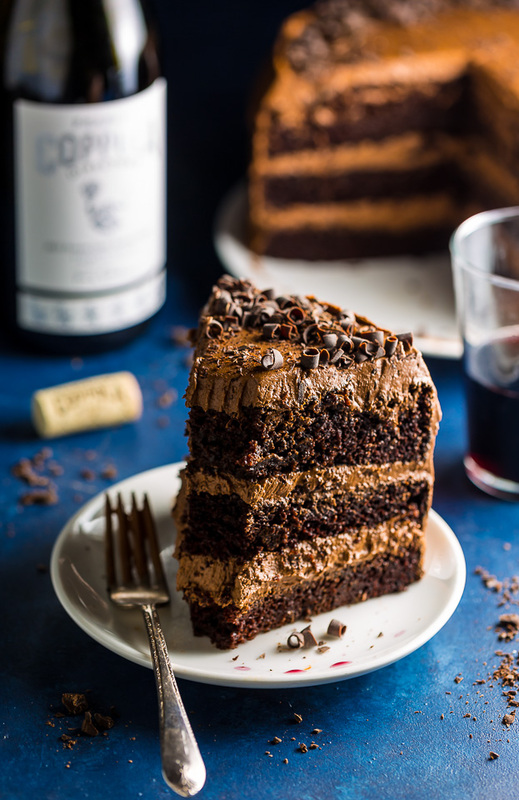 And just to be clear, by celebrating I mean eating massive slices of this red wine chocolate cake and watching sappy romantic comedies on netflix. In pajamas. With extra wine and chocolate on the side, of course! This wine cake has been in the back of my brain for years now! So when I stocked up on vino last week, I made a silent vow I would finally get cracking on it. And I’m so glad I did. Because you guys, this might be the best chocolate cake I’ve ever had. IN MY LIFE. And if you know me, you know I’ve eaten hundreds of chocolate cakes. One quick thing I want to get out of the way: if you don’t love red wine, or at least like it, you should probably skip this cake. Because the flavor definitely shines through! It’s in the cake and it’s in the frosting. But if you’re like me and you love red wine with a burning passion, pop that cork and preheat that oven. Because we have a cake to bake! So let’s start off with ingredients! This is an oil based cake and can be made with vegetable oil, canola oil, or even refined coconut oil. However, I do not recommend substituting oil with melted butter. 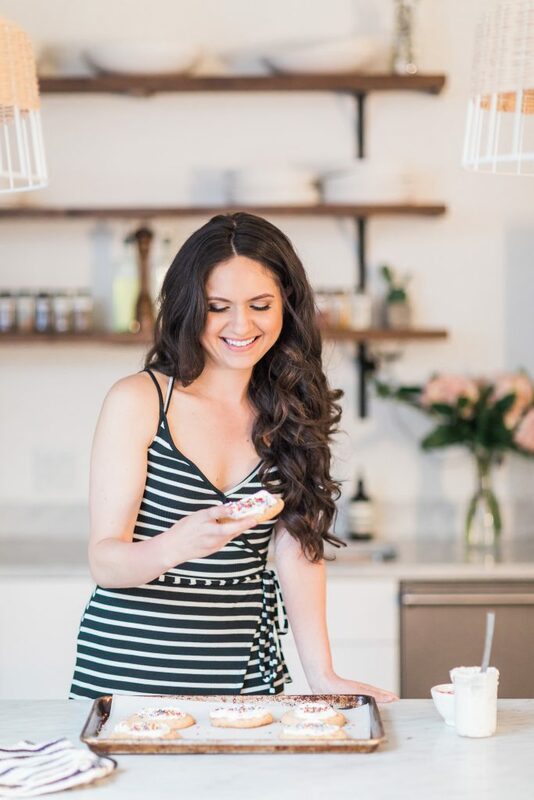 Because cold ingredients don’t bind evenly, you’ll want to make sure your eggs, egg yolks, and sour cream have all come to room temperature before you begin baking. When measuring your flour, it’s important you’re not packing it into the measuring cup. Packed flour will yield a dense and dry cake. It’s also important not to over mix the batter! The cake layers should all be baked on the middle rack of your oven. If you don’t have enough room in your oven to bake them all in an even row at once, bake them in two batches. And of course, you don’t want to over or under bake! Over baked cakes will be dry, while under baked cakes will sink the middle. For the frosting, I suggest using a quality dark chocolate, such as Lindt 70%. I don’t recommend using milk chocolate, but semi-sweet chocolate may be used if you prefer a very sweet frosting. Finally, your cakes should be completely cooled before adding the red wine fudge sauce and frosting. 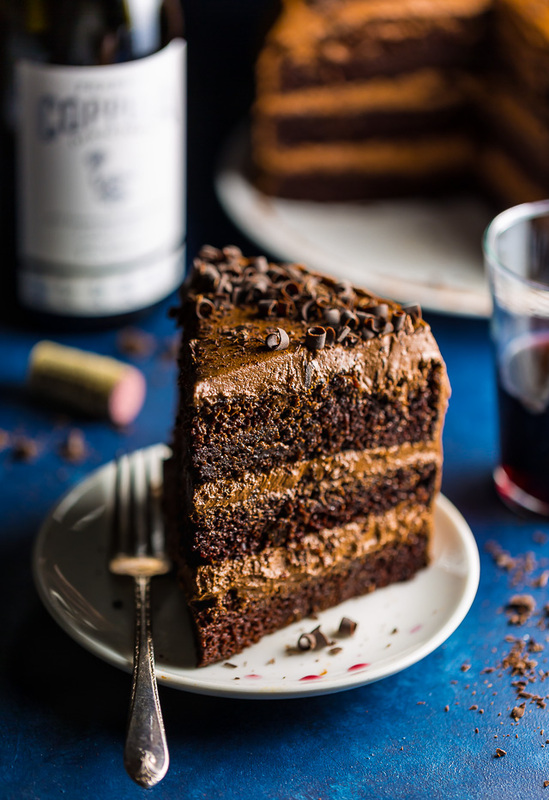 And if you try this recipe for Red Wine Chocolate Cake, let me know! Leave a comment below and don’t forget to snap a pic and tag it #bakerbynature on instagram! Seeing your kitchen creations makes my day. Preheat oven to 350°(F). Cut out three 9-inch round segments of parchment paper to line your cake pans with. Spray each pan generously - sides and bottom - with nonstick cooking spray, then place the parchment paper cut out in the bottom of the pans and spray again. It's important to make sure every bit of pan and paper are sprayed so your cakes don't get stuck. Set pans aside. In the bowl of a stand mixer fitted with the paddle attachment, or in a large bowl using a handheld electric mixer, combine both sugars, flour, cocoa powder, baking soda, baking powder and salt; mix on low until dry ingredients are thoroughly combined. Use your hands to break up any large clumps of brown sugar, if needed. Set aside. In a separate large mixing bowl, combine the eggs, sour cream, milk, wine, oil, and vanilla extract; whisk well until ingredients are thoroughly combined. Pour mixture into the dry ingredients and beat on low speed until just incorporated. Pour in hot water and continue mixing until completely combined; about 1 minute. Divide the batter evenly among prepared pans. Bake in preheated oven for 30 minutes, or until a wooden toothpick or cake tester inserted in the center of a cake comes out clean or with just a few moist crumbs attached. Cool cakes in the pans, placed on a cooling rack, for 15 minutes, before removing from pans and transferring to cooling racks to cool completely. In the bowl of a stand mixer fitted with the paddle attachment, or in a large bowl using a handheld electric mixer, beat the butter on medium-speed until completely smooth. Reduce the speed to low and gradually add in the confectioners' sugar, beating until all of the sugar is completely combined. Add in the salt and chocolate and beat smooth. Beat in the wine. 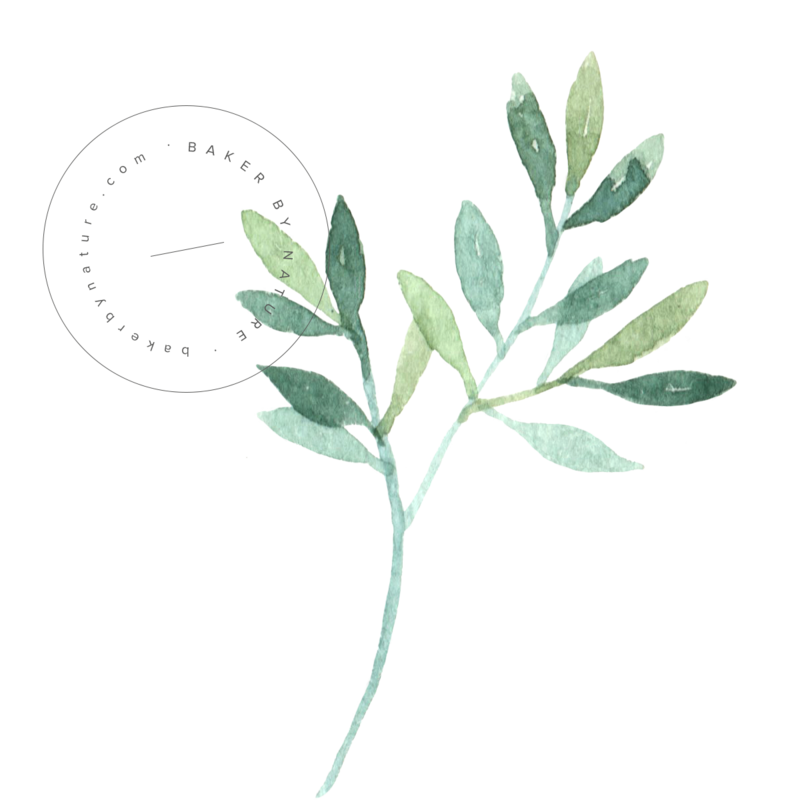 Once all of the ingredients have been incorporated, increase the speed to medium-high and beat for a full minute. Using a serrated knife, carefully trim the raised top of each cake, making each one an even, level surface. Transfer 1 layer to a large plate or cake stand. Spread an even layer of frosting on top, then top with another cake layer, and repeat. Top with the final cake layer. Frost the top and sides of the cake. Slice and serve, or keep refrigerated for about a week. Mmmm! 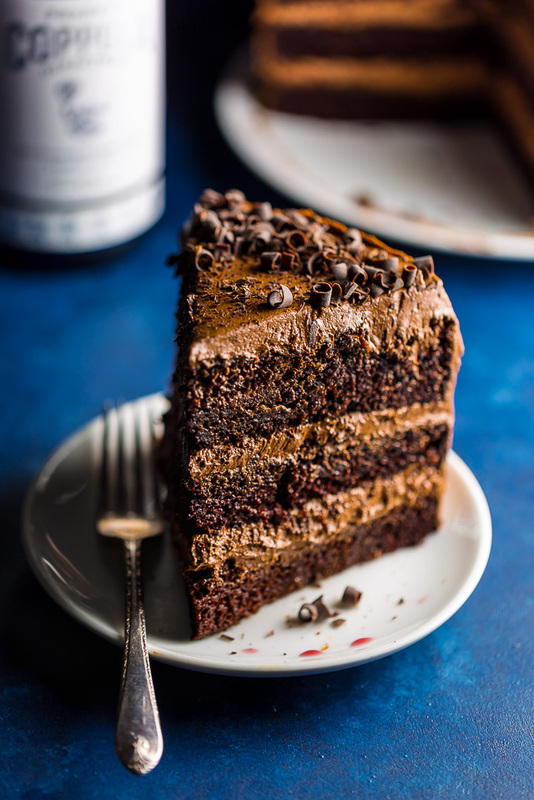 This red wine chocolate cake combines all of my favorite flavors into one delicious-looking cake! Can’t wait to try it. Yes, I’m wondering if you think you could substitute the wine with something else also? Just made this cake for my dad in law’s birthday. 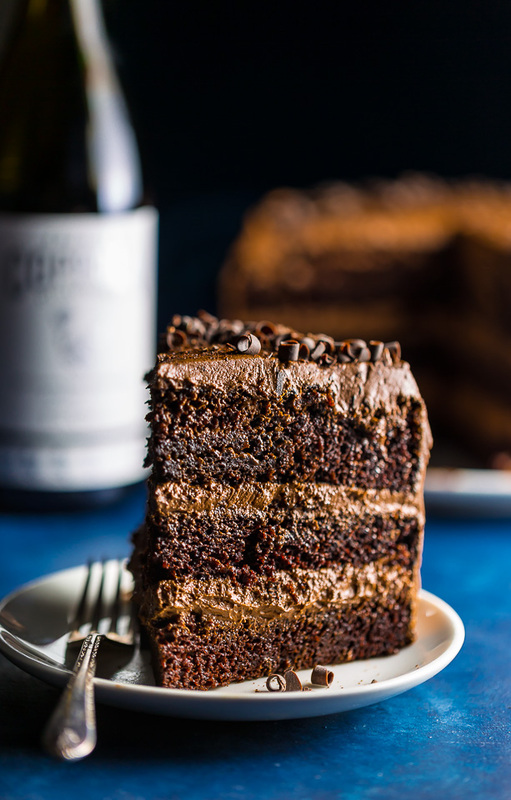 He always asks for a chocolate cake with chocolate frosting so I thought I would spice things up with the wine and it did not disappoint! It has a wonderful fruity flavor with the wine. Perfect combination. Thanks for the recipe! This is Raushan from Indian and I run an online cake shop in Delhi. I tried this Red wine chocolate cake a few days ago and it was superb and is my all time favorite now. I love making a variety of cakes. This cake looks amazing. Perfectly baked. I never thought of making a cake with red wine. I will surely give it a try and let you know how was it. Happy with this recipe. Can I use anything else except for sour cream ? I will say that the cake recipe was very good, but needs a couple important changes. For one, there is way too much baking powder and baking soda in this recipe. I was concerned about this before making, but figured I would test anyways, since the cake is very dense.. I definitely got a slight metallic aftertaste in the batter, but not enough to bother me. The cake showed quite a lot of bubble impressions, and dipped in the center after it baked, which indicates there was too much additional carbon dioxide present during baking. A general rule of thumb is about 1/4 teaspoon plus 1 cup acidic ingredient baking soda for every cup of flour or 1 teaspoon baking powder for every cup of flour, which means that this recipe should either call for 1 tablespoon baking powder, about 1 teaspoon of baking soda, OR a balance of the two. A tablespoon of baking soda and a half a tablespoon of baking powder is WAY too much. Other than that, the recipe was very good. I personally would use butter next time, because I like the flavor more than oil, and just use buttermilk instead of milk, whip the egg whites, and maybe add an extra egg yolk to make it more moist and light. Also think It needs a little more wine. The flavor coming through was masked and faint under all the other ingredients. Frosting was spot on. Wouldn’t change a thing about it. Overall, very good! Would Merlot wine work? It’s not quite a sweet wine, but not dry. I made this cake for my daughter in law who just turned 21 (thought it would be a fun twist on my usual chocolate cake. ). It turned out super delicious and gorgeous with all the chocolate curls. Everyone loved it; especially the birthday girl. Will definitely be making this again and I might add a little more wine to the batter next time…thank you for the recipe!